Taking orders for beef fall 2019 and spring 2020. ​Looking for a whole beef? If you reserve a whole beef we will be able to give you the best price on an order of beef. Find friends or family and split between the group. Please contact us right away for a whole beef so we can get the processing scheduled or take the beef to butcher yourself. Beef is frozen in cryovaced packages and labeled with the cut name. Pre-sliced, great for kabobs too! 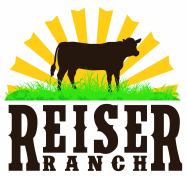 Please contact us to buy beef directly from Reiser Ranch. E-mail us your list or give us a call. Beef can be picked up at the ranch by Washburn or Beulah. We can work with a customer to arrange delivery for orders over $50.00. If the order is less than $50.00 and you are in Washburn or Beulah we will still try to deliver. When our schedule allows we will try our best to work with a customer to deliver to nearby surround areas. Areas we generally travel are Beulah to Bowdon, Washburn to Bismarck, Bismarck to Glen Ullin. We usually get to Bismarck once every 2 weeks. Willing to meet in nearby surrounding areas if an arrangement can be made. We do have customers all the way to Fargo.